Many parents make the mistake of assuming that since their child’s behavior is connected to their feelings, fixing the feelings will fix the behavior. Unfortunately, nothing could be further from the truth. It’s critical for parents to understand that processing your child’s feelings while they are happening is not constructive. Children become overwhelmed with emotions, and by the time they’re feeling angry or resentful, you’re already way into a negative situation. The time to teach kids about fire safety is not when the curtains are burning. In the same way, appropriate behavior is best learned before the crisis. And make no bones about it, if your child is screaming, yelling or punching things, you are already in crisis mode. I like to remind parents that the Chinese symbol for crisis is a combination of the characters for “danger” and “opportunity.” So when your child acts out, although it’s a dangerous situation, also remember that it presents a good opportunity for learning to take place. The time to teach kids about fire safety is not when the curtains are burning. Many parents try to deal with their child’s emotions first because they believe that’s where the bad behavior is coming from. If your child gets angry and smashes his sister’s dollhouse, asking him, “Why did you get angry?” or “Why did you do that?” is ineffective. It focuses on the emotion or the act itself, not the child’s thinking behind the behavior, which is what you really need to address. Your goal is to help your child solve the problem from which his feelings emanate, the thinking that sparks the emotion. The key is to focus on the underlying thinking and the faulty problem-solving that triggers the whole crisis. It’s important to acknowledge that most kids solve problems by being compliant. For instance, when you tell one child, “You can’t ride your bike, it’s too close to dinner,” that child might shrug and say, “OK,” and come into the house. But some kids solve problems by being defiant. If you tell another child exactly the same thing, he might answer you with, “I don’t care. Ben rides his bike! Why do I have to do this?” He starts raising his voice, getting more and more frustrated and angry. 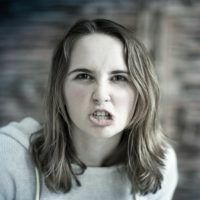 The underlying thought for the kid who acts out is probably something like, “This isn’t fair, you don’t have the right to stop me, other parents let their kids do it,” or some other thought which triggers a negative emotional response. Focusing this kid on his feelings of anger and frustration will notchange his behavior. Instead, you have to focus him instead on the original thought or perception that made him think your direction wasn’t fair, and the inappropriate behavior he used to solve the problem of “fairness.” In life, the problem for everyone—including your child—is that things are not always going to feel fair. There’s injustice in life, and injustice leads to frustration. Or there are times when you want to do something, but it’s just not the right time. And that can lead to frustration and anger for your child if he doesn’t process it the right way. How do you start effecting this change in your child’s perceptions? The next time your child acts out, instead of asking him why he did it, try saying, “Let’s look at what you do when you get angry.” That way, you’re teaching him that he’s angry and getting him to look at what he’s doing with the anger. The primary goal of behavioral change is to get people to do something different when they’re upset, angry or afraid. The next step is to ask, “The next time this happens, what can you do differently?” Don’t try to tell him, “You shouldn’t feel this way,” or “Those feelings aren’t valid.” Just say, “The next time you feel this way, what can you do differently?” It’s a very different process than the one that begins with “Why do you feel that way?” or “Why did you do that?” When you ask those questions, you’re going to get all the excuses and justifications which are so detrimental to actual problem-solving. Make the shift. Focus on your child’s thinking, not his emotions. This is the most powerful step you can make toward changing his behavior.